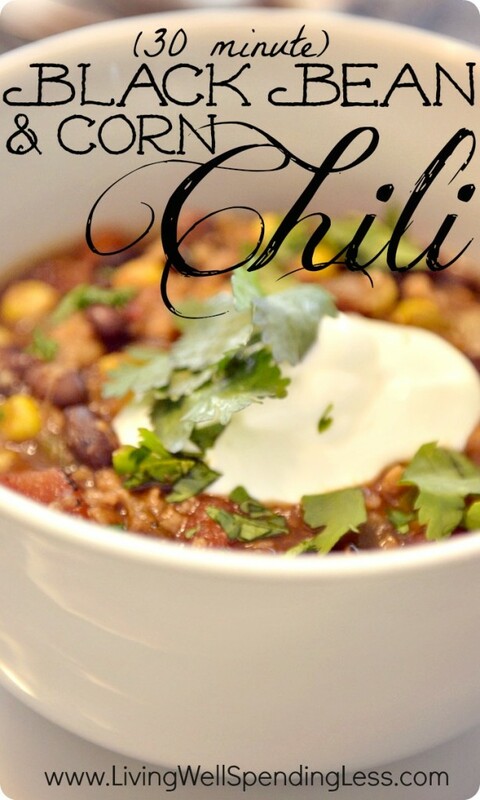 This is hands down my favorite chili recipe ever! Not only is it super easy, coming together in less than 30 minutes, it uses mostly basic pantry staples which makes it super thrifty too. 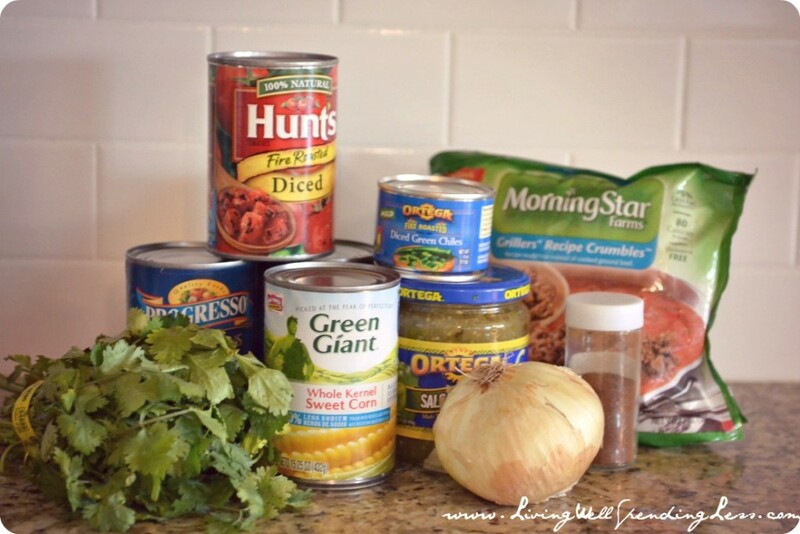 The key to the super fresh flavor is the green verde chili, so don’t skip that part! As usual, I used vegetarian protein crumbles instead of ground beef, but those of you who prefer REAL meat could substitute a pound of ground beef or turkey instead. Although I personally prefer things a little spicier, I make this version fairly mild so that it is still kid friendly. (My kids absolutely love this recipe!) For more of a kick, you can add hot chiles, fresh jalapeño, and extra hot chili powder. 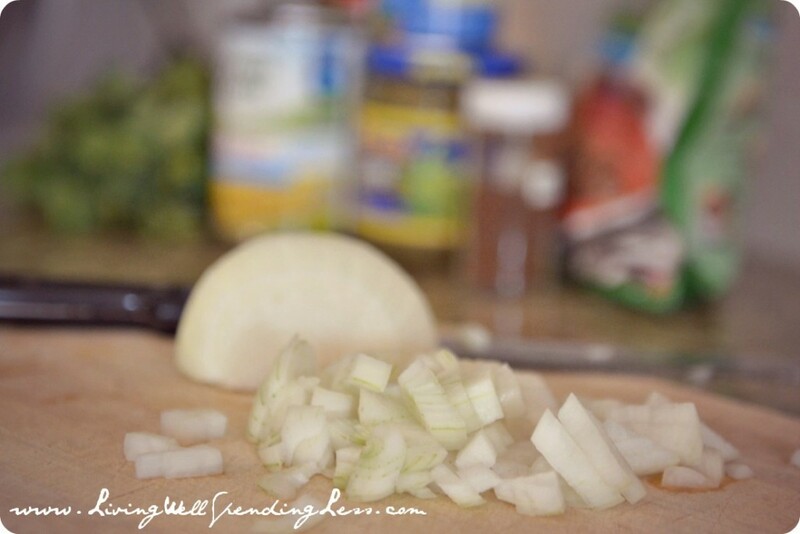 Step 1: Dice onions. Melt butter in large pot over medium heat. Saute onions until soft, about 5 minutes. 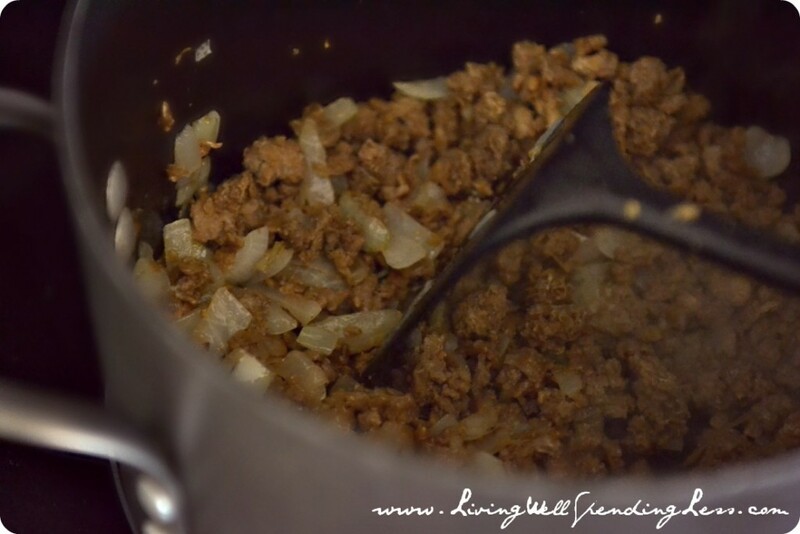 Step 2: Add vegetarian protein crumbles (or ground beef); cook until browned, 5-7 minutes more. Reduce heat to medium low. 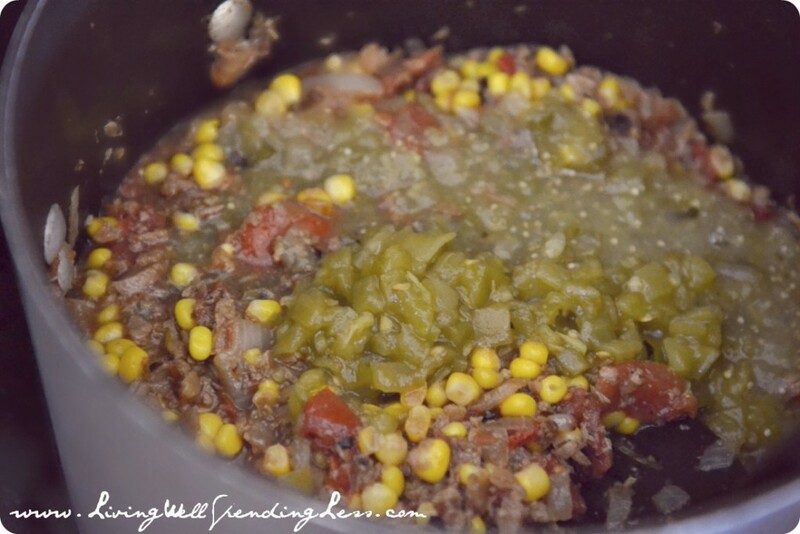 Step 4: Add tomatoes, corn, green chiles, salsa, & black beans to pot; mix well. Add chili powder. Bring just to boiling, then reduce heat and simmer 10 minutes. 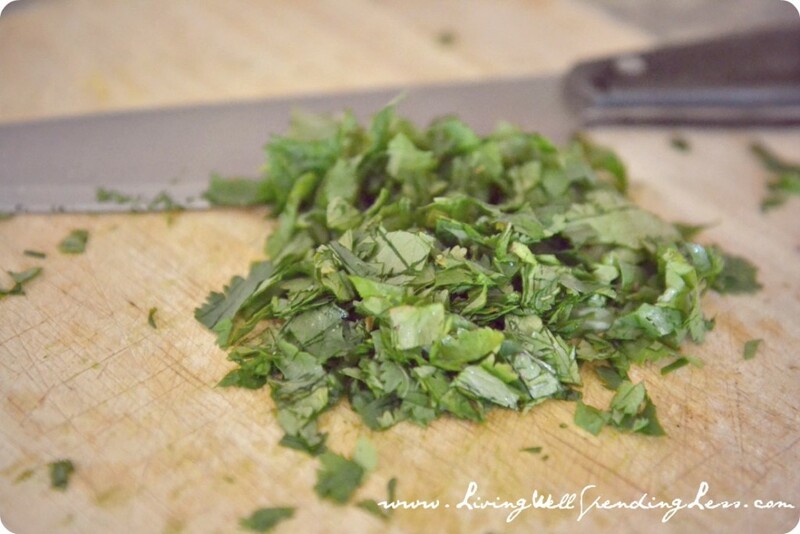 Step 5: Chop cilantro. Serve chili in bowl topped with sour cream, cilantro, & rice (optional). From pantry to table in only 30 minutes! Dice onions. Melt butter in large pot over medium heat. Saute onions until soft, about 5 minutes. Add vegetarian protein crumbles (or ground beef); cook until browned, 5-7 minutes more. Reduce heat to medium low. 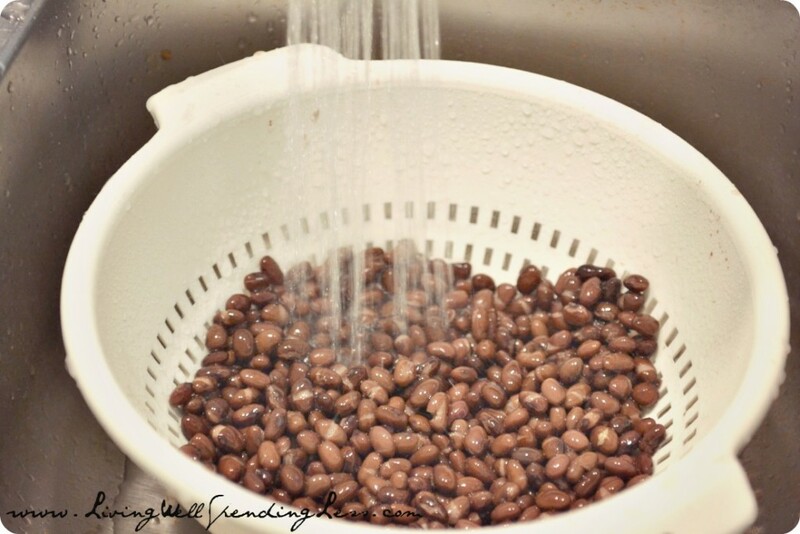 Rinse & drain black beans. Add tomatoes, corn, green chiles, salsa, & black beans to pot; mix well. Add chili powder. Bring just to boiling, then reduce heat and simmer 10 minutes. Chop cilantro. 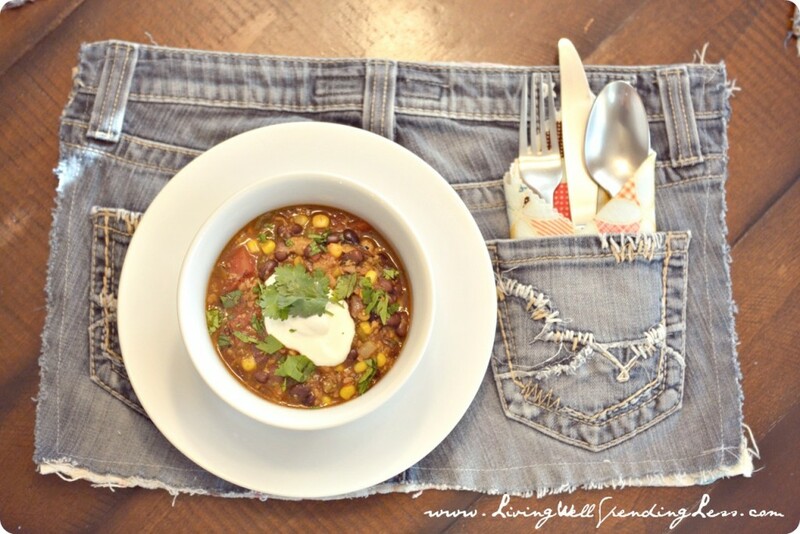 Serve chili in bowl topped with sour cream, cilantro, & rice (optional). 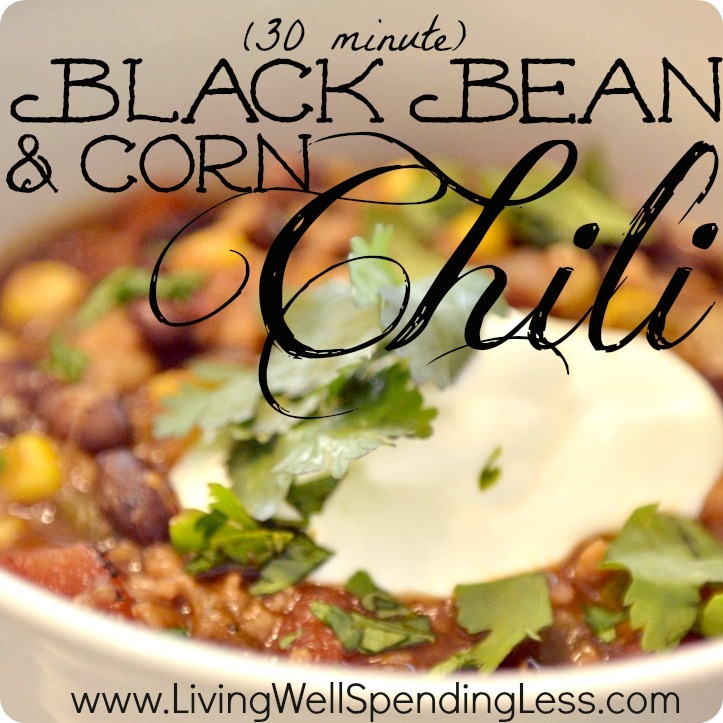 I looooooooooooove black bean chili!!!!!!! This version looks delicious with the green salsa and cilantro. Can’t wait to try it! Thanks Ruth!!! This looks so good! I’m adding it to our recipe file 🙂 Thanks for sharing. Oh yummy! This sounds so delicious!! 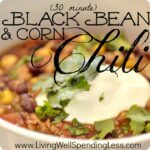 I have a go-to chili recipe that I normally make, but it’s definitely time to switch it up…and this one sounds so much fresher — a more “summery” chili (if that makes sense). 🙂 And I’ve never thought of using rice as a topping on chili – great idea! LOVE the placemats!!!!! And the recipe sounds divine as well! This looks very delicious! Thanks for sharing with Simple Supper Tuesday. Thank You for this recipe!! I worked all day then shuttled my youngest to gymnastics AND still had time to make a great dinner thanks to your recipe! It was yummy!! OK, I need a plan. How do I get to eat these awesome recipes that my husband won’t go near? Hmm. I know, I’ll take them as a dish to pass when I go to parties. This looks SO good I really do have to make it but Steve really won’t go near it. Not even in the same room. He’s picky, picky, picky. This kind of dish is has a magnetic pull for me. I love it. Thanks so much for sharing the link on my blog hop last week. It’d be featured but I already am featuring your tray make over….so this one will have to wait. Loved this. Fast , easy, flavorful. I thought I had chili powder in the cupboard but didnt so I used an envelope of mild chili seasoning (we are spicy wimps so always use mild versions) . Now that looks super Delicious!!!. The recipe looks so easy thanks for your time posting it for us. As a picky eater, discovering new foods I love, I wanted to try this. Ive never liked beans, chili or spicy food, but gave it a go. I love this. Its 84 degrees in Ohio, and I made this bc of the comment about it being a “summery chili”. Very good. I doubled the chili powder, and added a splash of pink sea salt … and Its still not too spicy! I made this tonight for dinner and it was sooooooooooooooo good,I loved it alot! Ruth, we LOVE this recipe! The salsa verde makes it! I’ve been using a similar recipe before, but we like this one much better. We usually use ground turkey. We are getting a freeze storm tonight, and this is the perfect warm meal for our family to eat. Just finished making this recipe and YUM. Great quick-n-dirty chili. My husband added a little bit of cinnamon for a hint of smoky sweetness. I made this for dinner tonight, and we loved it! Even my picky 2nd grader asked for a second helping! I will be adding this into our list of favorites. Thank you! I was looking for a recipe to use up this extra bag of morning star veggie crumbles i had, and then I saw this on pinterest. I love chili with corn and was extremely excited that I could make this really quickly. I would give it 4 out of 5 stars, only because I prefer cumin in my chili, thus I added 2 tbsp to it. Then It was perfect! It was really good with out it, but for me, It just doesn’t taste like chili without cumin. I am so in love with this recipe. Speaking as a broke vegetarian college student, it’s hard to find tasty meatless recipes that are healthy but won’t break your bank. I found this recipe and was ecstatic because most of the ingredient I already had! The only ingredients I had to buy were the green chiles and the corn (which only added up to about $2.00 even when I bought them organic.) I went home, threw everything in a pot, and dinner was served in less than 15 minutes. It was so, so easy. The only part of this recipe I didn’t follow is the adding of the protein crumbles. The recipe was absolutely fantastic. I topped the chili with a dollop of plain Greek yogurt (instead of sour cream) and it was perfect. My boyfriend and his roommates even had some (and they’re anything but vegetarians at heart). This is definitely a new favorite! I’ve made this recipe and it is so good!! The salsa verde adds a great flavor! Thank you!